(Newser) – Students at Ohio's Mason High School came into school Wednesday to find a surprise on their lockers: what a Mason City Schools Facebook post called "messages of hope and healing," per the Telegraph. 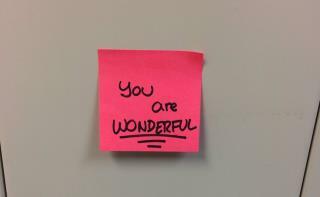 Those messages were encouraging phrases like "You are strong" and "You are unbreakable," scribbled on colorful Post-it notes that were placed on more than 3,600 lockers to lift students' spirits after a fellow student's suicide, reports ABC News. That "bright, funny, and strong" student, 15-year-old sophomore Kwadwo Boateng, died by his own hand on Aug. 25 and was the second Mason High student to take his life this year, reports WLWT. Quit killing yourselves kids, now what the Creator had in mind for you! Students also gathered together after school and had a barn raising. Ohio, the build me a barn state. Another story of kids acting like adults, while professional football players are begging to act more and more like brats.